Birthday Bash Event! Gummy Lump Melissa & Doug Puzzle Storage Case & Puzzles Review & Giveaway! Gummy Lump is the perfect go to site to find amazing Birthday gifts for the kids in your life. You can shop by age, category or brand so you are sure to find the perfect gift for the Birthday kid! They carry quality toys that stand the test of time. Danika has recently gotten very interested in puzzles. She love them. The wooden puzzles by Melissa & Doug are perfect for her because they aren’t too difficult. I found this great puzzle storage case from Gummy Lump that includes six wooden Melissa & Doug puzzles as well. Danika LOVES this puzzle set! She loves all of the fun puzzles which include different animals, alphabet letters, vehicles and numbers. I love the puzzle storage. I am all about having the kids toys organized and this puzzle case will hold twelve puzzles. I love watching her put the puzzles together and see the proud look on her face when she completes them! 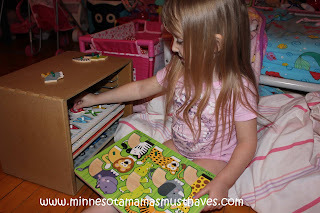 Why we love it: I love that it keeps Danika’s puzzles organized and Danika loves the puzzles! Suggestions for improvement: None, this is a great gift idea! Buy It! 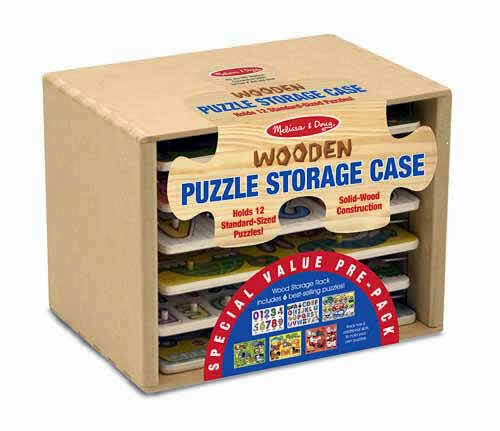 You can buy the Melissa & Doug Puzzle Storage Case on Gummy Lump’s site for $70.39! Win! One reader will win the Melissa & Doug Puzzle Storage Case from Gummy Lump! Visit Gummy Lump and tell me another product you’d love to own. Open to US only. Giveaway ends May 18th at 11:59pm. Winner will be drawn by random.org and announced on this blog as well as emailed. Any household that has won a giveaway from GummyLump.com in the past 90 days is not eligible for this giveaway. Should an ineligible entrant be chosen as the winner, all rights to the prize will be considered forfeited and a new winner will be chosen. Products reviewed were provided to me free of charge. No compensation was given in exchange for this review. My opinion is my own and is an honest view of my experience with the product. Winner will have 48 hours to respond or a new winner will be drawn. Email address must be in at least one comment or visible on your profile to win. Good Luck! Birthday Bash Event! HABA Fairytale Bingo Review & Giveaway! Birthday Bash Event! Boon Bug Pod Review & Giveaway! « Birthday Bash Event! HABA Fairytale Bingo Review & Giveaway! My son is starting to go crazy for alligators, so the Chomp and Clack Alligator Wooden Toddler Push Toy would be perfect for him. My daughter would love the bella butterfly tunnel! Visit Gummy Lump and tell me another product you'd love to own. I'd love the wooden floor easel! Subscribe to Minnesota Mama's Must Haves by Email (not feed)-remember to activate your subscription! Current subscribers count too. Like Minnesota Mama's Must Haves on Facebook-leave your facebook name with your comment. My kids would love the Ice Cream set from Melissa and Doug, along with just about everything else they sell. GummyLump always has the BEST selection of toys. I love the Slice and Bake Cookies Play Food Set by Melissa and Doug and the 3D Paint by Number sets, so cute. My son would love the Grocery Store Food Play & Lemonade Stand by Melissa and Doug. I follow Gummy Lump's Blog. I entered the Puzzle Pods giveaway. I entered the Burger King GC giveaway. I would LOVE the Alphabet Puzzle Cards by Melissa & Doug. I would like to own the Wooden ABC Blocks in Canvas Bag by Uncle Goose. I signed up for the Gummy Lump newsletter. I'd like to have the Fruit Crate Play Food Set. My kids would love the Verdie Chameleon Kids Beanbag Toss. I'm entered in your Play Doh Giveaway. FB fan of MMMH – Becky L.M. I also like the Garage Play Time Wooden Toy by Alex Toys. Liked Gummy Lump on Facebook as Audra Lynn W.
i'd love to also own the melissa & doug train table!! Entered the Burger King giveaway. Entered the Scotts Naturals giveaway. My guy and I really want the banana split food set!!!!! I would like the Melissa and Doug wooden train set on Gummy Lump for my boys. I would love the Pizza Party play set. I entered your Doodle Bag giveaway. I would love the Melissa and Doug beginner pattern blocks. I like the Decorate your Own Train kit. I would love to own any of the Melissa and Doug toys. I also like Gummy Lump on Facebook. Another product from Gummy Lump that I would love to have is the Big Rig Trucks Vehicle Set by Melissa & Doug. I like the floor easel. I'd love to get the Pattern Blocks and Boards Wooden Toy by Melissa & Doug for my daughter. I follow Minnesota Mama's Must Haves through Google Friend Connect. I follow Gummy Lump's blog through Google Friend Connect. I'm a facebook fan of Minnesota Mama's Must Haves under username Jennie Tilson. I receive Gummy Lump's newsletter. I entered the HABA Fairytale Bingo Game giveaway. I entered the aden + anais giveaway. I entered the Scott Naturals giveaway. The Melissa & Doug Pizza Party is so cute! My daughter would love the Melissa and Doug Play Kitchen! Entered the Aden and Anais giveaway! I entered the Hero Fruit Spreadables Gift Pack giveaway. My daughter would love the Ice Cream Parlor Play Food Set by Melissa and Doug. Thanks for the chance to win! Id love this set of three mini Automoblox! I think these cars and vehicles are the COOLEST toys ever! LIKE Gummy lump on Facebook! entered Lil Tike Garden Wheelbarrow giveaway! follow GUmmy LUmp Blog publicly! 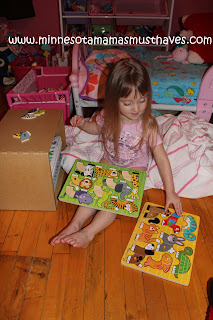 My daughter would love the 100 pc Rainforest Floor Puzzle by Melissa & Doug. I like gummy lump on FB – Cari s.
I 'like' Gummy Lump on Facebook. I entered the Little Tikes Wheelbarrow giveaway. I follow Gummy Lump's blog via GFC. I like Minnesota Mama's Facebook page as Zootastic Zookeeper. I like Gummy Lump on Facebook as Zootastic Zookeeper. I'd love to own the PlaSmart Blue Plasma Car. Entered $75 GC to Zutano Baby Boutique giveaway. Entered aden & anais Sleeping Bag or Swaddling Blankets giveaway. My son would love the chunky construction vehicle puzzle. He loves all machines right now. I like the Melissa and Doug shopping cart. I'd love to have the First Play Frolicking Frog Wooden Pull Toddler Toy. I like Gummy Lump on FB. Decorate Your Own Jigsaw Puzzle Wooden Craft Kit for Kids by Melissa and Doug…I could see getting that for one child as a project to make a present for another child.